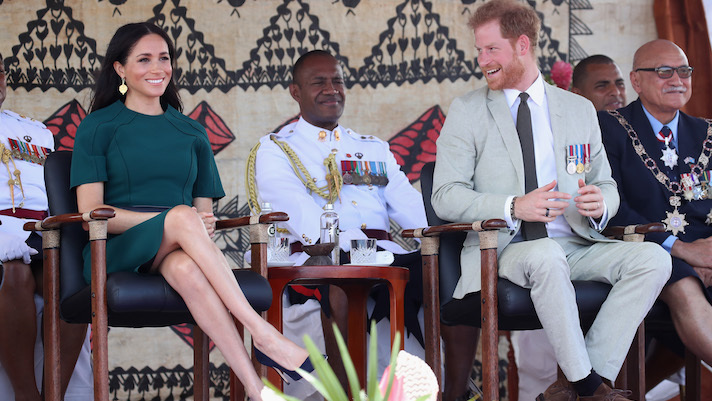 On the Prince's trip to New Zealand and Australia he was seen donning the wearable which uses heart rate, motion and temperature sensors to track a user's sleep. Prince Harry appears to have turned his attention from wedding rings to the Oura ring, a smart wearable that uses heart rate, motion, and temperature sensors to track sleep. During his royal tour to Australia and New Zealand the newly minted Duke of Sussex was spotted donning the ring-shaped wearable, driving speculations as to what it could be before People Magazine identified it as the Oura ring. The technology includes a body temperature sensors that takes a read of the user’s body every minute and can them compare it to the individual's baseline while sleeping. The small ring also employs infrared LEDs to measure the blood volume as it moves to the finger. The last component is a 3D accelerometer and gyroscope, which can identify “the amplitude and intensity of your body movement,” according to the webpage. The technology comes with a corresponding app which gives user’s their sleep score, activity score and readiness score, which takes into account a users “sleep balance” and how well a user slept the day before. Oura started as a Kickstarter in August of 2015 where it raised $650,000—exceeding its $100,000 goal. Then, in 2016, the Oulu, Finland-based company raised $5.3 million to support the development of the ring. That same year the company was named a CES Best of Innovation Award honoree. In March the company revealed the second generation of the ring, which Prince Harry appears to be sporting, that is smaller than the original and lets users customize the device. Celebrity style and health advice has long influenced public trends and ideas. Researchers from the University of Ottawa and several other organizations proposed a study in Systematic Review that plans to look at how celebrities impact health knowledge, behaviors and attitudes. Celebrities wearing fitness trackers is nothing new. In 2013 a gossip site caught Ryan Reynolds with a Fitbit Flex. That same month Gwyneth Paltrow told the Daily Mail the Jawbone UP was the secret to her fitness successes. Wearable reported on President Obama spotting a Fitbit Surge and comedian Stephen Colbert donning an Apple Watch. This is the first time we've seen one on a royal though, and something of a coup for a relatively unknown device like the Oura Ring. In mid October Prince Harry and his new wife Meghan Markle announced that they were expecting their first child. Baby tech is on the rise in digital health. At last year’s CES there was an entire section devoted to baby tech — with many products focused on sleep. The Oura ring spotting shows Harry donning a sleep tracker of his own but only time will tell if the newest royal baby get his or her own sleep tracker.